“Behold” is one of those words that hasn’t really spanned the millennia. Maybe because we don’t “behold” much in our day. Beholding is the idea of becoming silent and focused on one solitary thing. It’s a matter of turning that one thing around all it’s angles to not just see, but perceive all it’s faceted edges and details. When you behold something you’re intimately acquainted with nearly every part of it. 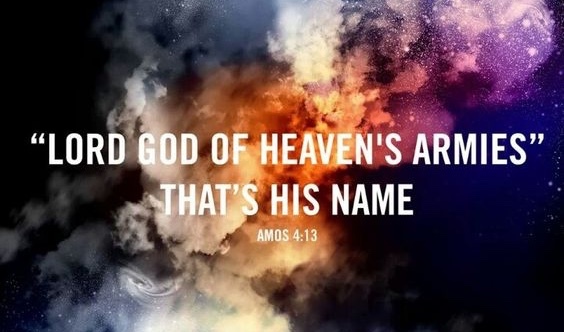 The Lord speaks through Amos and tells His children to, “Behold… (He who does all these things is) the Lord God of Hosts is His name.” Here’s two more things that haven’t really survived much in our language today either; Hosts, and the concept of the Name. When I say the name, Rockefeller, what instantly comes to your mind? Money? Oil? The piano donated to our church? When I say, Hitler, doesn’t that also conjure up thoughts, images, and even feelings? Neither of these infamous people need a first name attached for their last name is infamous enough. With one single name I can elicit an emotional response in all of us right now: Irma. Names are more than identifiers—they can carry with them hope, sorrow, fear, joy, and even disdain and hatred. A “host” as in “the Lord of Hosts”, is an innumerable amount of people, things, etc. Specifically in our context it’s not just a huge number of things, rather in this use we’re saying that a host is a massive army. As it is related then to the idea of The Lord having the “Name” of “the Lord of Host(s)” We should understand that Jesus Christ is the universally renowned Master of an innumerable number of heavenly armies. Wow. And what is it about this amazing Lord Amos is here to tell us? Isn’t it that by this Lord’s own hands He fashions—He forms the mountains. No one could ever decipher the thoughts of God, for God grants it to His prophets to know what He wants them to know. This God, the only God, turns the dawn into darkness. In case you missed it that’s a bad thing, darkness is not as happy of a thing as the dawn. Yet this Lord of Hosts does this. Furthermore, Christ is the one who treads on the high places. He is the one who can reach the peaks of Everest and the Matterhorn not by vigilant ascent but by condescension. As it pertains this morning, this mighty Lord of Hosts also, “creates the wind…”. Each of these things mentioned, every one of these flexes of the muscles as it were, are not hard for God, and more interestingly, not momentary either. God’s Name is not great because he once decided this was how it was going to be. He did that for sure because we know that He decrees all things from the beginning. But note that God hasn’t merely wound up the world and then walks away. No, Christ continues to form the mountains and planes by earthquakes. He changes the landscape of this world through localized floods and wildfires. The Lord covers the sun with the moon and raises up storm clouds to bring noon day to darkness. The Lord has delivered His Word to us, and continues to illuminate it day by day. As we see with Irma and other hurricanes, He creates wind and causes that wind to bring to nothing concrete buildings in Barbuda and other islands there in the tropics. And as I pen these words this category 4 storm, that the Lord of Hosts has created, is about to make landfall on the Florida Keys. We take refuge in the wings of this wind creator, this hurricane maker. Not because we feel that the storm will not effect us, but because we know that not one drop of it’s rain has gone rouge against its creator. Let us behold this God. Let us behold the beauty of this Lord of Hosts. Let us direct our attention, the attention of our families and neighbors to behold the greatness of the name, the infamy, and glory of our great God. The God who forms the mountains and therefore has the right to flatten them with his winds, if He sees fit. And let us also pray for those who will be effected by this wind in a negative way. That we might be able to speak truth into their hearts concerning the gospel and that they will not make shipwreck of their souls but find their peace in the loving arms of this awesome and powerful Creator. I love you all. Be safe, and let us together, though separate, worship the Lord in unity.